it’s the beginning of a new year and quite a long time until my birthday in august, but this is the *biggest* thing i’ve ever had on my birthday wishlist. i really really really wanted to go to the first squam… so many people i love and admire were there and came back with amazing stories and photos to share of their experiences. but it’s so far far from here that i couldn’t. we spent a fortune last year travelling to shiny places and needed to regroup and make some more money! now i discover, that this year, there will be two more! and i am wishing and dreaming and planning and surfing the cheap airfare websites to see if our travel and adventures budget can stretch far enough to go to the september squam in new hampshire. it’s a crazy birthday wish and i’m crazy enough to believe it might even come true! i’ve been drooling over the workshops and the website all morning, trying to decide which classes to attend. i would definitely be doing one of andrea’s through the viewfinder sessions (how could i not, when this post she wrote got me so excited about the whole ttv thing that i went and got myself a kodak six-20 f brownie camera to play with) and spent a whole month posting photos on my blog/flickr using a fake ttv filter. then, there’s jen’s truth & consequences sessions, christopher frost’s temporary earthworks and just about every other class listed that all have me so excited that i’m almost literally jumping out of my skin to sign up! This entry was posted in six years in london and tagged squam art workshops. Bookmark the permalink. Oh I REALLY want to be there this year too!!! I’ll keep my fingers crossed for you if you’ll do the same for me. I fervently hope to sit with you on the dock and smile at each other and giggle that WE GOT THERE!! i so want to go this year too. i promised myself i would but i’m taking 5 weeks vacation this spring so i don’t know if i’ll be able to take more time off. having said that… i live close enough that i may do the long drive down for the weekend. perhaps we will meet there? keeping my fingers crossed for you. oh yeah, and now I am thinking what a trip that would be…… oh, and Nic, he’s the man! You’ve asked, may it be so! I hope you’re able to go! I have wanted to do something like that for a long time, but have never been able to. I guess it will have to wait a while longer, since right now I am hoarding money for a trip to England. mmmm…only you stopping you….Nic is a wise man! We too are looking forward to September – for us it is a trip to Japan to visit our son, wife and granddaughter. May all our plans, wishes and dreams come true! Happy New Year Leonie. oh I hope you find a way. I can’t wait! Oh Crap. I was going to write you about this. Maybe, if you do not come and visit me in April, but instead we both go to Squam for the September Session? I have been seriously considering going, but keep thinking no because I “shouldn’t” spend the money, blah, blah…useless excuses. And now, you say this….what do you think? If you leap, I’ll leap with you. We can catch each other. 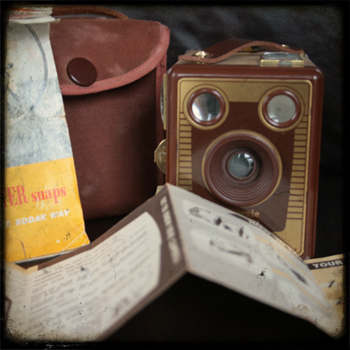 oh, that brownie camera is gorgeous! and i feel the same way about squam! i really hope to be able to save enough to go too. i’ll meet you there! by the way, i found your blog through the new Creative Goddess forum!